Sometimes customers need a little encouragement to place their first order after creating an account. There are many reasons this is the case, for example customers may forget to bookmark your site, thus they might have difficulties finding your store second time around. In this article I’ll present one way of keeping an eye on your customers orders count and sending first order reminder emails, trough free Magento extension named Inchoo_OrderReminder. Can send reminder emails to customers who haven’t placed any orders yet, on configurable interval in days. 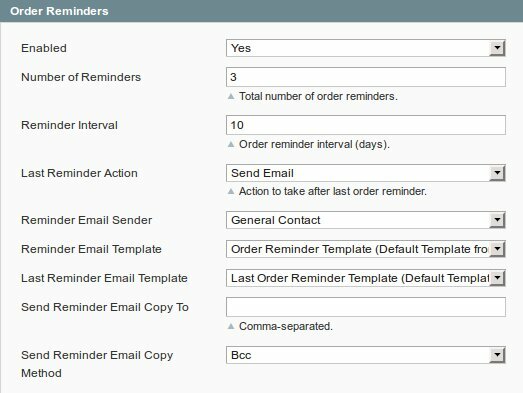 Maximum number of email reminders is also configurable, as well as action to take after sending last email reminder (move to different customer group or delete an account). Regular and last order reminder email templates are configurable trough Magento’s transactional email templates feature. When triggered, this function will derive dates from Number of Reminders and Reminder Interval configuration options, taking Magento timezone configuration option into an account, and then grab all customers whose account has been created on that date, for every derived date. This function will then send emails to customers without any orders using proper transactional email template. It’ll also take actions of moving to another group or deleting customers who have been sent their last email reminder, if instructed to do so by system config options. For more details about Inchoo_OrderReminder you can always checkout and download up-to-date code from Inchoo_OrderReminder’s GitHub repository page. Cheers and happy coding! Hello. I have an entry in the log that the “Email sent.”. But they are not sent. I am the recipient and I did not get the emails. I use magento 1.4.1.0 and copied the Mailer and Info models into Mage\Core\Model\Email from last version. installed this extension. but don’t know how to run it. it does not work. please guide me how to run it. i have created an account. put reminder interval 1 but cannot get any email after one day. what else has to be done to run this extension? Thanks for the code but I had some trouble getting it working on 1.9. I also wanted to have a custom customer attribute so I could log the date the e-mail was sent & not just the last 3 days worth of new customers (for historical purposes). After a bit of tweaking got this to work fine..
Where do the logs get put out to? Ive installed this without edits, and went into the config panel to setup the sales emails. Unfortunately the changes in config is not being reflected in the xml, and not appearing in the cron. Any reason you could think of? but no email is sent, and messages has a NULL value. What could be some of the reasons for it to not send? if by “enabled set to 0” you’re refering to config.xml, that’s just an entry telling Magento the default state for Enabled dropdown accessible at System -> Configuration -> Sales Emails -> Order Reminders in Magento admin. That’s where you should enable Order Reminder and emails should be sent out if Magento installation and server hosting it is properly configured. Alternatively you can also create Magento controller to trigger this function manually for testing if you can’t wait for cron to kick in. The enabled is set to 0 I mean. I’m going to install this. Think it’s a great idea! Simple but great. Yes that’s true, for some reason processOrderReminders isn’t scheduled to run. Hello. Unfortunately there are multiple reasons why this error might occure. If it happens that you have more detailed error message containing line of code affected I might be able to assist. Hi while using it I encountered varien_object not found; this is when Observer.php is ran. It’s a great extension! this is working for us and helping to convert more prospects to customers in our store.